The other week, I got a random Facebook friend request from a suspiciously modelesque shirtless dude who sent me a message that read "I wish to accept friendship." We had no friends in common. My coworker Dodai got a similar request with the same message but from a totally different person. Were we among the chosen few humans who were among the first to be contacted by a small race of self-aware robots who existed only as Facebook pages? Nope— turns out, fake Facebook profiles are incredibly common. How common? Try 83 million common. According to The Guardian, today, Facebook admitted that four score million and three million of the massive social network's users aren't actually people — that's 8.7% of the site's entire user base. 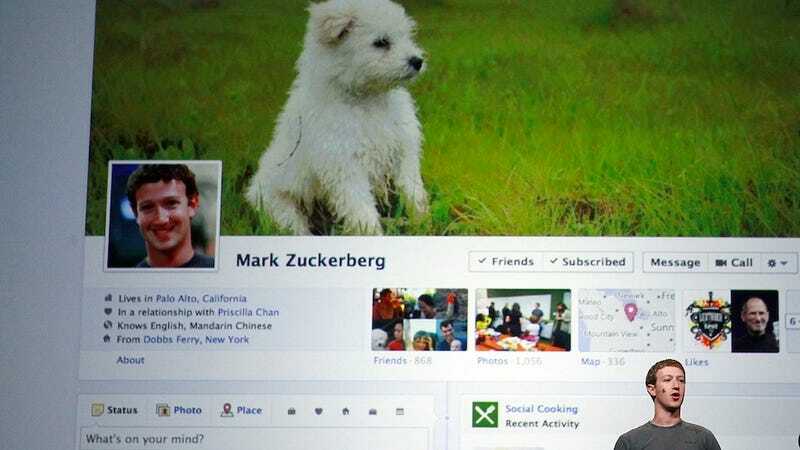 Fake profiles belong to people's pets, duplicate profiles that paranoid people maintain in case a future employer asks for their social networking password, miscategorized pages for businesses and other non-human entities, and 14 million accounts that exist solely to spam people. The surprisingly unsurprising numbers were revealed in the company's first quarterly report to investors. Its stock is currently worth about 20 bucks a pop on the market, down from a $38 initial offering price. Buy buy buy! (That's a joke joke joke). So the next time you get a weird rando friend request from someone hoping to give you TRIPLE FRIENDSHIP HAPPINESS, just ignore it. They just want to phish information from your account and blitz your inbox with offers for f R$ee vIa g r @.